Home Android and iOS Game Apps The Trail Tips and Guides The Trail: Overview and Town Building Upgrades to Unlock First? The Trail: Overview and Town Building Upgrades to Unlock First? Town Upgrades is needed to advance and improve your Town, but which buildings to unlock first? Refer below to learn some recommended buildings to unlock. - By default, the Warehouse building is unlocked. The Warehouse League table shows the towns who are the top warehouse traders. Getting your town to first will earn a special prize. Join with your fellow townspeople, fill those crates and sell, sell, sell! - This is highly recommended because it will allow your Town to chop down giant trees that gives 90 logs and 70 sticks per tree. Note that these materials will not disappear, giving your town mates a chance to use them too. - Chopped trees will regenerate after 2 days. 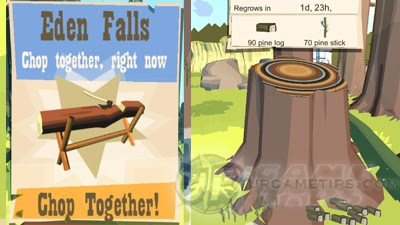 - By default, your town can only chop Pine Trees, but more types of trees can be unlocked as the game goes. - Used for crafting various items like Wooden Carvings. - Used to quickly fill up Warehouse crates and get Gold every day. - Used to process Planks. 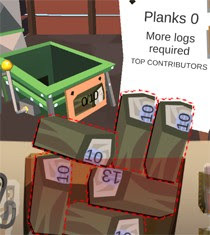 - Necessary building for processing Planks, used for upgrading your House to Lvl 5 and above. - Requires 10x Pine Logs = 1x Plank. - This will unlock another weekly assessment feature, for more chance to get Gold. - Explorer's Guild League table shows the towns with the best travelers (rival towns will be randomly regenerated), those who have journeyed to the furthest camps. - A position in the league table will earn Gold for your Town. Travel the trail and help your Town grow bigger and better. - Useful for active Towns, to discuss things like where to allocate resources or who will use them first. This will also enable fellow newbie neighbors to ask questions or help. - Tap on the chat bubble or Saloon building to enter. While inside, you can write short messages to other members of your town. There is a character limit of 144 characters and a profanity filter is in place. - Your own messages will appear in a different color than messages from other townsfolk. - Players interacting with the civic buildings / resource fields. - Only unlock if you or your townspeople would like to spend some real money for Gold (for Town upgrades only). - Unlock if you want to find a new Town to settle in. - Here you can buy various items and statues (with Gold) that gives your Town some extra bonuses. - Example: Warehouse Item Value Increase +5%; Logging Field Drop Increase +5%; and many more. - and many more as more content will be added to the game.